So 10 spins is now 13. 15 is 18. 24 is now 27. You get the idea. If you need more spins, that’s fine. Each extra spin costs $250 . . . and remember, you’ll get the first 3 additional ones free! 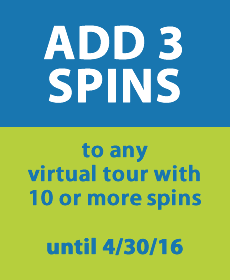 You can add video clips, slideshows, maps, and clickable links to the tour, too. call us (904.383.7746) or click here to get started!